*The unprecedented accumulation of wealth by the Black Nobility had its roots in the commercial ventures to the East made by Marco Polo of Venice in the 13th century. He was used to establish the largest export/import business in world history. And, yes, it grew to be the most profitable business venture of all time, as it effectuated the greatest transfer of wealth the planet has ever seen. This highly efficient enterprise was responsible for the most successful exchange of goods, services and resources from East to West, and vice versa, ever to have occurred. And, it continues up to this very day, with the very same families in firm control. CAVEAT: It’s extremely difficult to properly tease out all of the different Black Nobility families and bloodlines who dominated Europe back then … and who dominate the world today. Their labyrinthine inter-relationships are particularly hard to determine with any degree of accuracy. That’s because their absolute power and control is sustained by utter secrecy and stealth. Even Niccolò Machiavelli learned all the family secrets that he wrote in The Prince by watching their diabolical plots and convoluted machinations. Having lived in 16th century Florence when the House of Medici led “the largest bank in Europe, and through strategic marriage alliances, joined many of Europe’s royal families”, Machiavelli observed in real time the rapid expansion of the Black Nobility throughout the European Continent and beyond. This is where the previously mentioned “planned chaos” comes in, especially as it is on continual display by so many changing Italian governments. For the power families of the Black Nobility are the original purveyors of “Ordo Ab Chao”. It’s only by methodically sowing seeds of such chaos (read “terrorism”) that they are able to rule Italy and the Vatican, and, therefore, the rest of the world. Their unique MO of creating “order from chaos” can be seen everywhere on planet Earth. Where is their handiwork not apparent in 2017? In light of this crucial knowledge — Terrorism = Chaos = Black Nobility — those who really want to know who rules the world today can now begin to grasp the following elusive and carefully hidden truths. As this exposé states, “Britain” (actually the City of London), is referred to as the “New Venice”. Just as Venice was the most powerful and wealthy of all the northern Italian cities, London is the most influential today where it concerns global banking and finance. In other words, the Black Nobility completely rules over Great Britain by way of controlling the Financial District in the City of London, as well as the Crown Temple. FACTOID: Well before the East India Company was officially incorporated on 31 December 1600 in Great Britain, there were corporate entities established in northern Italy which enjoyed extraordinary commercial success and worldwide reach. As a matter of historical fact, it can be said that the birthplace of the modern corporation was the various Black Nobility-dominated cities of northern Italy. For example, the Banca Monte dei Paschi di Siena was founded in 1472 in Siena, Italy and is currently the world’s oldest surviving bank. Corporate charters were also issued to companies in Venice, Genoa and Verona as early as the late 1400s in the wake of Marco Polo’s exploits in the Far East. For it is through the business entity known as the CORPORATION by which the Black Nobility effectively runs the world. A century of unrelenting globalization has transformed the global marketplace into a vast and monolithic network of public corporations, each of which can be easily controlled. How simple is it for the hidden owners of every publicly traded corporation to compel the boards of directors to implement the Black Nobility’s agenda? It’s also important to note that the original M.A.F.I.A. was made up of powerful northern Italian clans which functioned as the enforcement arm of the Black Nobility. Were it not for this rich man’s Mafia, it would have been much more challenging to maintain their ascendency in the Italian, European and Global power structures. Of course, the Mafia’s primary weapon against all enemies, perceived or otherwise, was and is terrorism. The central organizing principle of the Mafia has always been the strategic use of terrorism and tactical staging of terrorist attacks. The purposeful generation of fear is the means by which the Mafia organization maintains internal discipline, as it is also the primary means by which societies everywhere are strictly controlled. At the very core of the Mafia’s command and control structure is the consigliere. He is the advisor and chief of staff to the “mob boss” who is responsible for overseeing the waves of terrors that coerce the local business owners and rich families to pay for the now ubiquitous “protection racket”. Once this community-wide network of extortion and bribery is firmly established, all the other criminal activity is easily foisted on the local people. Loan-sharking, drug dealing, gambling, prostitution, human trafficking, gun running and other crimes quickly become a part of the fabric of society. After most of the once innocent people eat their own piece of the criminal pie, they inevitably become susceptible to blackmail and other types of hush money schemes. What very few historical researchers and geopolitical analysts understand is that this same model of control by terrorism was adopted by the corporate sector at its very inception. It has likewise been utilized by governments large and small since time immemorial. 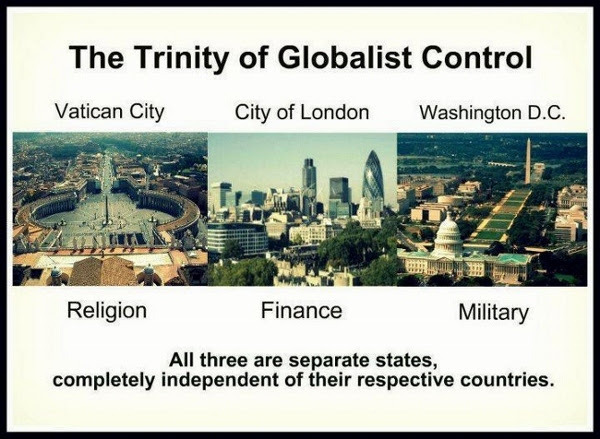 More significantly, it has become the standard operating principle of the New World Order ruling cabal which seeks to foist a One World Government upon the entire planetary civilization. KEY POINT: M.A.F.I.A. = “Mazzini autorizza furti, incendi e attentati.” (Italian for Mazzini authorizes thefts, fires and poisonings) The original M.A.F.I.A. is truly one of the world’s first organized terrorist organizations. Even NATO named their premier terror operation Operation Gladio, which is headquartered in Rome. Now frequently referred to as the “North Atlantic Terrorist Organization”, this warmongering institution is the most feared military machine the world has ever known. And, it’s completely controlled by the Black Nobility via the Committee of 300 and several other secret societies and clandestine organizations. Clearly, terrorism has become a universal scourge in the Third Millennium. There is no continent or nation, state or province, city or village that is immune to its destructive and deadly consequences. Each day brings more evidence that every terror attack has been conceived and coordinated by the very same group of intelligence agencies and secret services. Just like NATO is but a cat’s paw of the Black Nobility, so is the U.S. Intelligence Community (e.g. CIA, NSA, DIA, FBI), along with the Israeli, British, French, German, Italian, and many others. Many have surmised that it is the Roman Catholic Church, and especially the Jesuits, who really rule the world. Yes, the Church has played a vital role in the colonization and command of the planet, as have the Jesuits in the ironclad control of most nation-states. However, this story is much more complicated and profoundly misunderstood even by the most astute investigators. Just like the Mafia, the Church and the Society of Jesus were both taken over the very day that they were formed. Within the firmament of Roman Catholicism, Jesuitism occupies its very own universe. As a matter of fact, there is no other denomination that is as ultra-liberal, intellectually oriented and transparently militant as the Jesuits. By all outward appearances, the Society of Jesus does not even resemble a holy order much less a religious organization. That’s because they aren’t. This begs the questions: Who are these prelates in black business suits? Are they the original Men in Black? While the Jesuits are frequently mentioned in the piece linked below, it’s important to point out that the Society of Jesus was founded by Saint Ignatius of Loyola in Spain in 1540. Íñigo López de Loyola was born into a family of Marrano Jews, perhaps the world’s first appearance of organized crypto-Jewry. The critical point here is not that the Jesuits are well known in certain quarters as being “God’s diplomats” because they function as the real ‘Department of State’ for the Vatican. The point is that the Roman Catholic papacy has been controlled by the Jesuits since they became the appointed military defenders of the faith. In spite of a self-imposed rule never to occupy the papacy, the Vatican is now headed by the former Jesuit Archbishop of Buenos Aires, Argentina. Like the many popes before him, Pope Francis wears the highly distinguishing skull cap, also called a kippah (or yarmulke) in Judaism! In other words, way before there were Jesuits running the show in Rome, there were…. In view of these revelations, the $64,000 question ought to be: Who is it, exactly, that is dictating to the Black Nobility? The answer to that question brings us much closer to understanding: Who really rules the world? Stay tuned for Part II of this special series on the Black Nobility and the concealed power structure of the world. In the meantime, re-reading William Shakespeare’s “The Merchant of Venice” might provide some penetrating insights into the back story of the true origins of the notorious Black Nobility. So, too, will a fresh reading of his “Romeo and Juliet” which was set in Verona, Italy. In his day, Shakespeare was famous for disseminating highly privileged information via his highly coded tragedies and comedies. His many classic works served as vehicles for transmitting secret knowledge to those who had the capacity to comprehend it.